Consider Joy? Well... it's our 33rd anniversary and we want to give you a gift! Consider JOY? 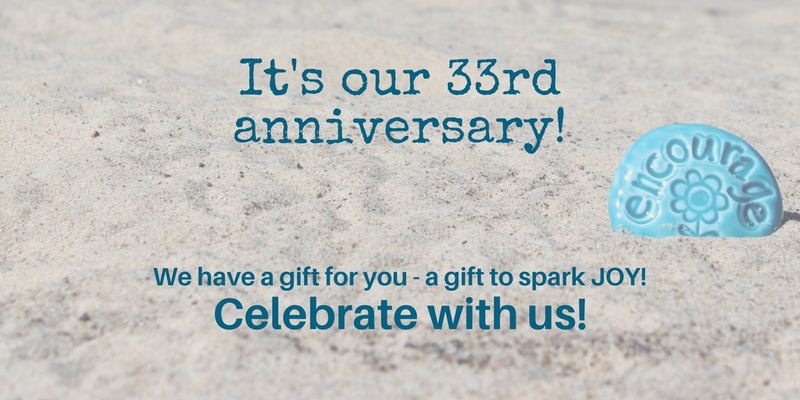 Well… It’s our 33rd anniversary and we want to give you a gift! Sigh. Sometimes it’s hard to find and feel the joy. All of it? Really? Joy in all the trials – seen and unseen? Consider joy? Those trials in your head – the ones that wake you at 2 AM, and the trials which seem insurmountable, even if you’re the one that created them? Consider joy? What if you woke tomorrow with only those things for which you are thankful today? We’re thankful for 33 years of marriage – today. May 27th. Even though we’re thankful, finding and feeling that joy isn’t always easy. Marriage and life haven’t always been easy. Boy-oh-boy, have there been some trials. And thirty-three years together as husband and wife doesn’t give us a “pass” to get out of the current or future trials, either. However, we have a promise. 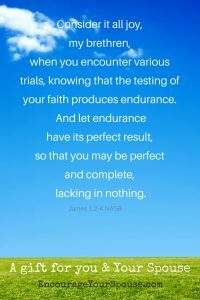 Those trials testing our faith produce endurance. Endurance is a gift for which to be thankful… and if we practice that endurance, we will be complete. We will lack nothing. There are gifts along the way. We’ve seen them already and we have faith there will be more, according to God’s will. In this “not easy” season we’re holding onto that promise of lacking nothing – with both hands, all four hands. We’re trusting. We’re exercising our faith. What are some gifts in this season of marriage that’s been less than easy? Our adult children are gifts. Consider the joy of children. At first, becoming parents on our 1st wedding anniversary was a trial. Oh, yes. That wasn’t easy. But joy has come from being parents to those children. 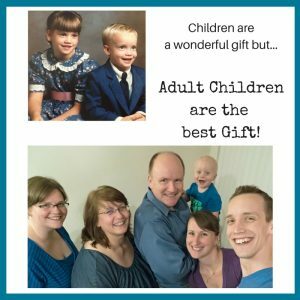 Adult children are the best gift! They are our sparks of joy and watching them serve the Lord is a truly joyful gift. 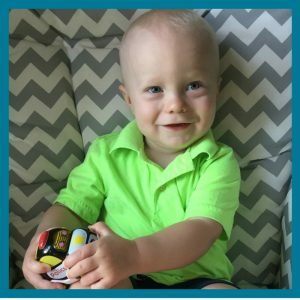 Our grandboy is a gift. Consider joy. Everyone predicted grandparenting would be a joy. (Frankly, I was skeptical. It was just a crying, poopy baby, after all…) Today, a year and a half later, we are unable to truly define where this overwhelming joy in the grandboy comes from… it must come from God. It must! Rob has been saying that “If God loves us the way we love our grandchild, then we’re golden!” Yes. That’s a gift. A gift filled with joy. In the midst of our trials, friends have reached out. A kind word. Prayers. (Oh, you have no idea what a gift it is to know that friends are praying for you and with you!) Encouragement despite ongoing circumstances is a gift of joy. We’ve received gifts – both monetary and physical. Every. Single. Friend. Is. A. Gift. 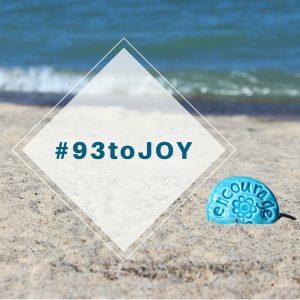 Consider joy – yes. There is joy in knowing you’re surrounded by the Godly love of friends who are also ministers. There’s joy from family, of congregational members… and friends who unknowingly provide gifts. In this time that’s not been easy, we’ve been surrounded with those who give without measure and without any hope or expectation of repayment. We’ve been learning the art (and gift) of humbleness. It’s not always an easy gift – but it’s priceless. And there’s joy in it. We are learning endurance – and it’s having its result. I hope. Our faith is increasing. We have no other choice but to have faith. And we’re already feeling that promise that we lack nothing. Because when you really think about it, all our hope lies in Jesus. In Jesus’ sacrifice. And the future His sacrifice and God’s grace will provide… is already providing. That’s ALL joy. Are you going through a time that’s not easy? As an anniversary gift, one we can all enjoy – and spark some JOY – we’ve created something. We will be right beside you! We are doing this too! This is our gift to you – a gift to spark some JOY! Need to learn more about this gift? Read more HERE. 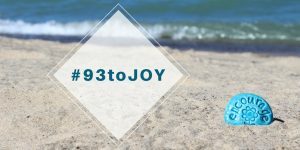 Join us on our 33rd-anniversary experience to consider joy! Experience some joy in your marriage also! Wonderful to know that endurance pays…we have experienced this too..and in the end..it is all so worth it.